The Lower Modernisms – 023. 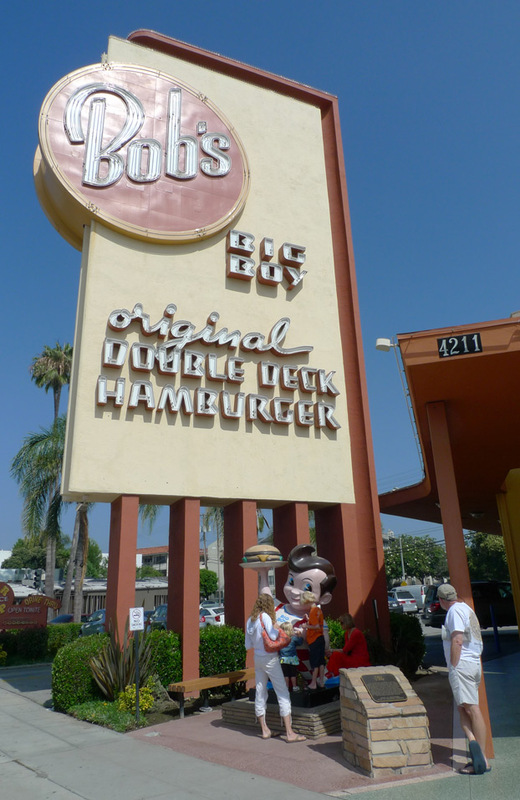 Lomo Featured Project: Bob’s Big Boy, Burbank. 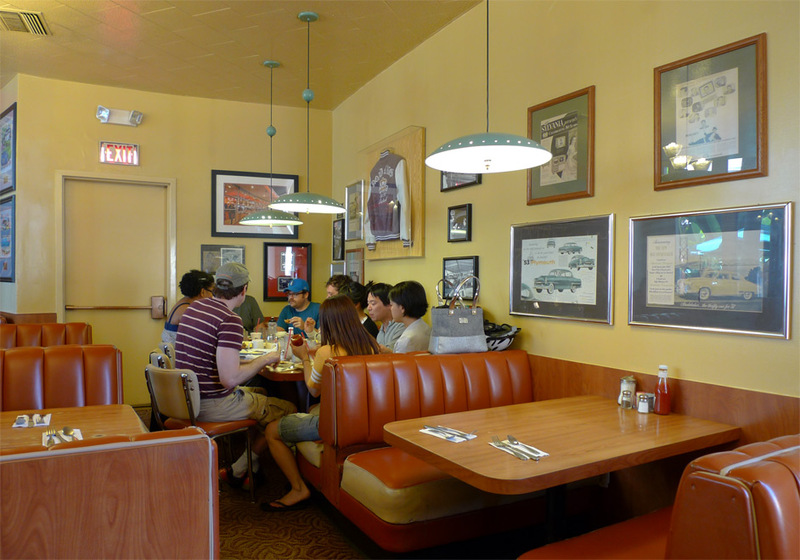 2011 Googie Coffee Shops Bicycle Ride Series, June Ride. July 22, 2011 by James Black. 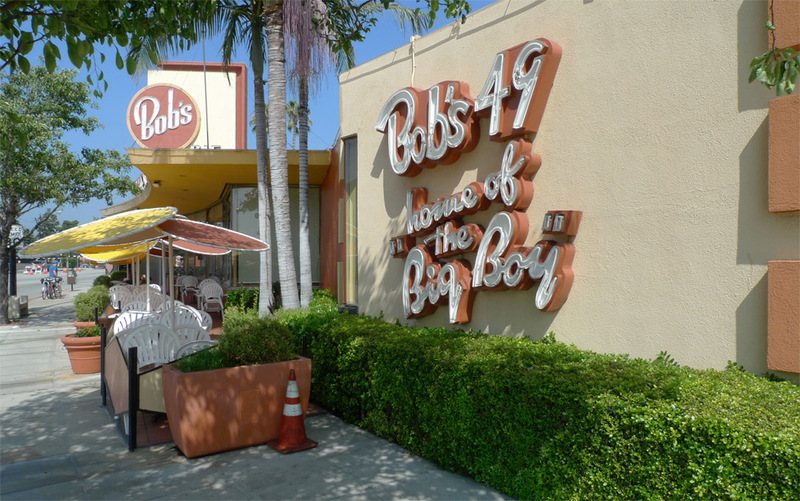 The destination for the June Googie Coffee Shops Bicycle Ride Series was the Bob’s Big Boy restaurant on Riverside Drive in Burbank. The oldest remaining of the Big Boys, it is a fine specimen and nicely preserved. 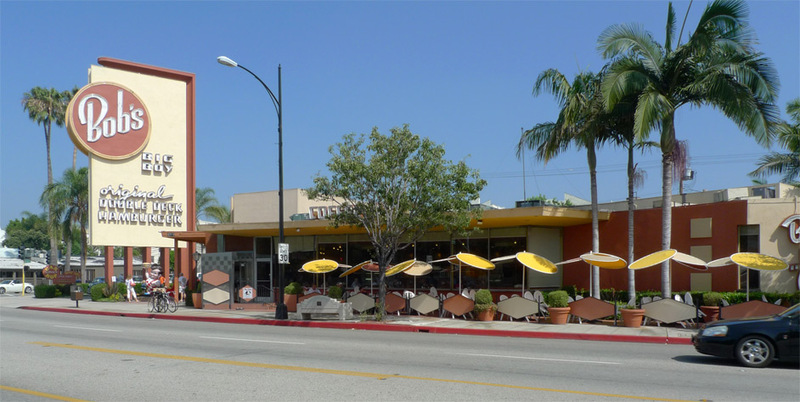 Designed in 1949 by Wayne McAllister, stylistically it is a bit of a hybrid between the “streamline moderne” style and Googie proper. The enormous slab sign, freestanding and detached from the building, is all geometry and neon, a classic roadside attention getter. 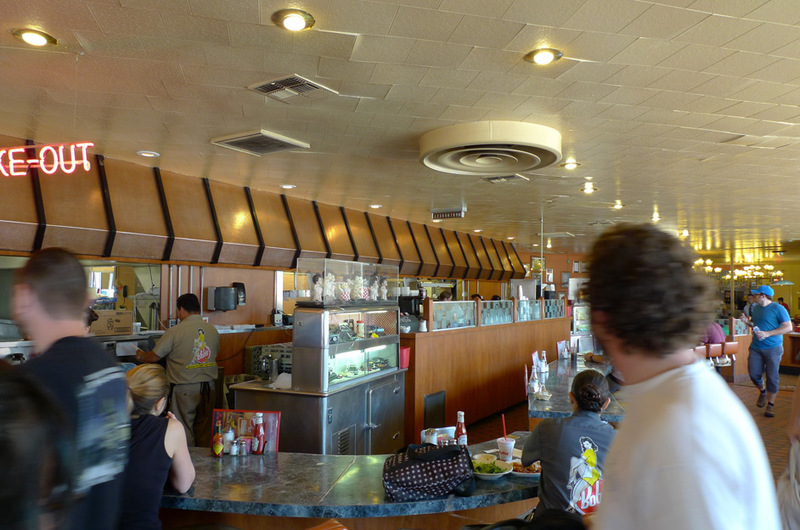 Whereas the coffee shops by Armét and Davis of the 1950s share the common characteristic of dynamic sections and bent and sloping rooflines, McAllister’s Bob’s Big Boy is flat and horizontal. Much of the action happens in plan – the the front façade and projecting horizontal roofline of Bob’s are curved, contrarily in the opposite direction of the curve of the street; the ellipse created within these two curves becomes the sidewalk dining terrace. 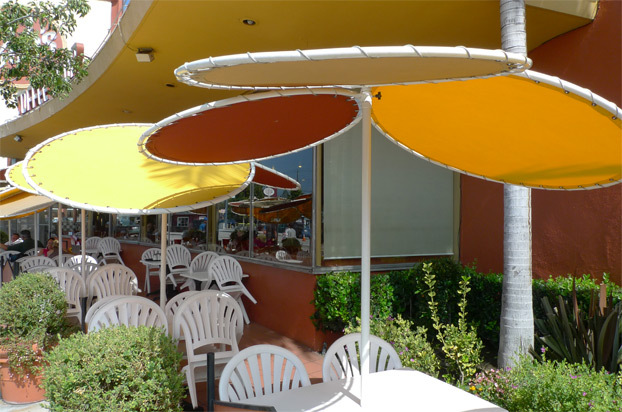 The umbrellas are awesome – perfect discs of stretched canvas, jauntily arranged and in cheerful colors. They are cantilevered from one edge rather than center-supported like a conventional umbrella. I wonder if you can buy these somewhere. The interior feels airy, with a lot of natural light from the south-facing window wall and generously proportioned with a high ceiling. From the entrance one is greeted with this impressive vista through the long, curved dining room that seems to go on forever. 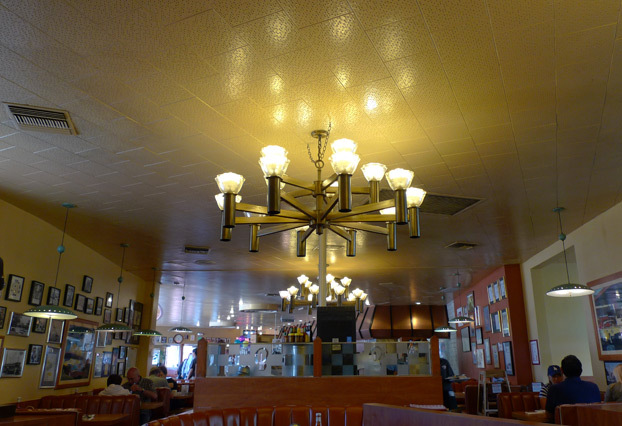 The mansard-like soffit over the kitchen seems like a familiar Googie move, but must have been an innovation in 1949. Acoustic tiles are adhered to the ceiling in a running-bond pattern, run at roughly a 45-degree angle to the main axis of the space, which solves the problem of how to align them within a long, curving room. The ceiling is further decorated with some impressive hardware. Our large party made the most of a double-wide booth in the rear, and then the food was tasty.